On sheer aesthetic value, this is one of the loveliest things I’ve ever stitched. 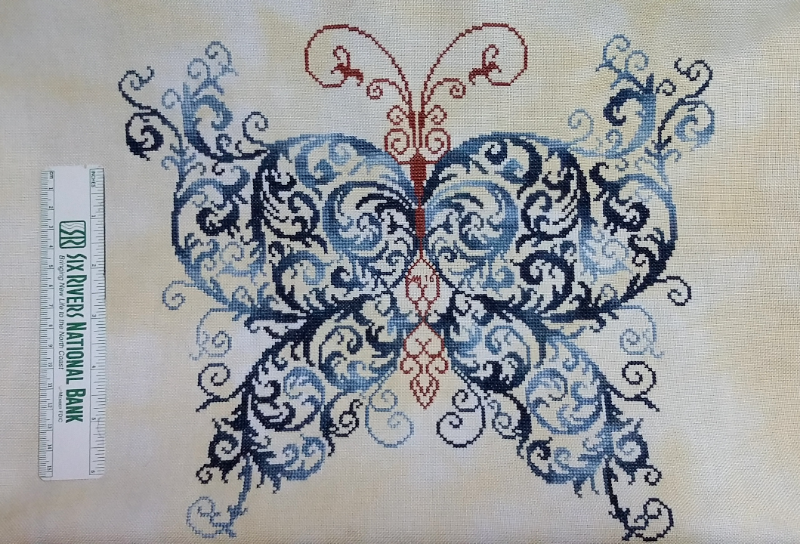 Alessandra Adelaide’s Spring Butterfly appeared in a spring issue of Just Cross Stitch a few years ago. Like, 2013? 2014? The model was stitched in solid DMC B5200 — snow white — on a medium blue fabric. It was pretty. All respect to the stitcher and designer, but I think mine is prettier. 😀 . I started it in December last year, and it was the main stitch project I’d taken with me to Ventura, and did much of the stitching for it while sitting in the ICU, holding space for a remarkable group of friends who were gathering there for the saddest reason of all. It came back home with me saturated with all I’d experienced while I was there: yes, sadness, of course, but also friendship, caring, support, self-sacrifice, tremendous patience, courage, and all the shades of love you can imagine. I was honored to be there with them, at best an acquaintance to most, there mostly to care for Sue, for whom I’d go through much more than that to be a help and comfort. When I brought it back and took it out of the packing case, thinking to work on it through what was, admittedly, a pretty rough patch in my own life, it was as if the fibers themselves had absorbed the emotional energy of the trip. I could feel each of the people I’d spoken with, comforted, grieved with in the ICU as if they’d just walked in to sit down with me in my living room. I have boundless love for all of them, but. 🙂 I smudged the dickens out of the whole thing — go on and judge me, I don’t care — which had the hilarious side-effect of attracting every single cat hair in what must have been a three-mile radius around my house. I spent more time picking cat fur off it in the weeks after that than stitching. And then I put it aside for other projects… and then I got resistant to finishing it, and then a little superstitious about it. I found no mistakes in the chart whatsoever – cannot fault the quality-control on it. It is symmetrical along the vertical axis, though I realize the variegeted floss tends to fool the eye, in that regard. I’d rank the difficulty of the project overall for intermediate to advanced level stitchers — definitely “advanced”if you’re thinking of using variegated flosses. Man, get a load of those blues. This is one I’d stitch again in a heartbeat if I found the right color combination. I’d definitely want to find variegated floss like this, with long, long flows of color rather than a choppy, confetti-style dye job.